The seaside town of Porthcawl developed as a coal port in the 19th century but because of developments at other larger ports this trade declined and in line with many coastal resorts in the Victorian era the town developed its tourist trade. 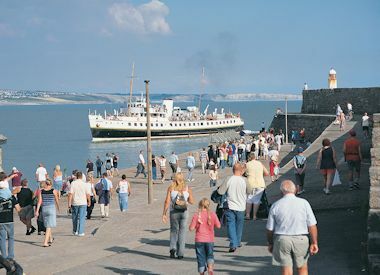 In order to improve the area and make it more attractable a promenade was built in 1887 to commemorate Queen Victoria’s Golden Jubilee and then in 1932 the Grand Pavilion was opened to cater for the tourists and has provided a much needed venue for shows. It seats 635 people and is still a popular venue today for various events with the towns annual pantomime being a popular show. 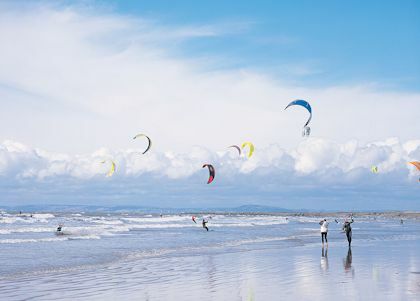 One of the key attractions of Porthcawl is its splendid beaches with a total of seven spread along the shore line, with some being awarded Blue flag status. Some of these beaches are secluded and allow the visitor to have a quiet relaxing time, whilst some are busy with families and there are plenty of walks in the area for the more energetic tourists. 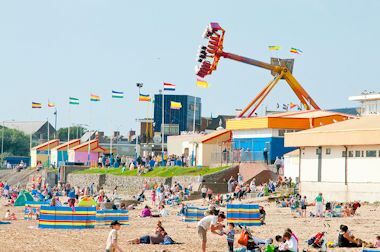 For those that want something more exciting there are amusement and fun parks which will keep you occupied but for those that are interested water sports the area regularly hosts surfing competitions which are open to locals and visitors and have become a regular feature for the town. The area around Porthcawl also has a number of interesting venues that you may be interested in, these range from the Mythyr Mawr and Kenfig Dunes National Natures Reserves and for those interested in historic buildings there is Newcastle and Ogmore Castle with all these venues being within six miles of Porthcawl. Visitors to the area will have a number of options when looking for restaurants and places to stay as the resort has a variety of hotels, B&B’s, cafes and take aways.